The recent murder of Ataollah Rezvani demonstrates the widespread persecution against Baha'is in the Islamic Republic. Any hope in the newly elected Iranian president to solve the crisis has so far been overshadowed by a series of fatwas from Khamenei, writes Zackery M. Heern. On August 24, a well-known Baha’i in the Iranian port city of Bandar Abbas was shot dead by an unknown gunman. Mr. Ataollah Rezvani’s body was found with a gunshot wound in the back of his head. He was left in his car on a deserted road leading out of the city. Rezvani’s death is mourned by Baha’is and Muslims alike. According to countless stories by family members and acquaintances, Rezvani was constantly helping those in need, whether it was caring for hospital patients in Bandar Abbas or driving to the opposite end of the country to help his niece and nephew after both parents were imprisoned for being Baha’is. 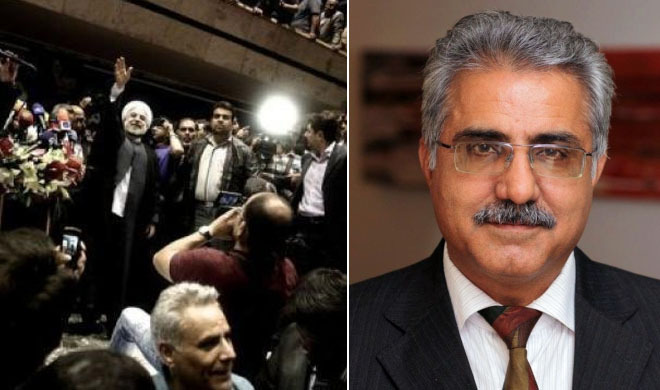 Reports about Rezvani’s funeral indicate that people traveled from far and wide to attend his memorial service, which lasted until 2 a.m.
ALSO READ Social media – a new political tool in Iran? All indicators suggest that Rezvani’s murder was motivated by the fact that he was a Baha’i. Prior to his murder, he had received repeated threats. Additionally, the assailants did not steal his wallet, car, or anything of value aside from his cellphone, suggesting that the murderers were not motivated by money. Baha’is have suffered persecution in Iran since the inception of the Baha’i Faith a century and a half ago. Persecution worsened after the Islamic Revolution of 1979. Since the early 1980s, the Iranian government has imprisoned, harassed, and executed Baha’is. Leaked secret documents lay out a systematic program for the destruction of the Baha’i community, which is the largest religious minority in the country. Official media outlets in Iran regularly include anti-Baha’i propaganda, which reinforces the government’s intentions of exterminating the Baha’i community. A recent study of official Iranian news agencies notes that anti-Baha’i propaganda appears in state-run news media every one to two days. Baha’is are commonly blamed for economic problems and political unrest. Anti-Baha’i propaganda often features illustrations of zombies and the grim reaper. Baha’i holy places, known for their well-groomed gardens and beautiful architecture, are depicted as deaths-scapes. Like most Baha’is, Rezvani and his extended family have suffered continuous harassment. Along with all other Baha’i students, Rezvani was expelled from university shortly after the revolution. His uncle served a prison sentence in the 1980s and was jailed again last year at the age of 85. His sister, Sahba Rezvani, recently served a three-year sentence. Her daughter and son-in-law have also been jailed in recent years. Additionally, government officials have forced members of the Rezvani family to shut down their businesses. Rezvani lived most of his adult life in Bandar Abbas, where he installed and managed municipal water treatment systems. He was well known in the city as an active member of the Baha’i community. In the past few years, the leader of Friday prayers (imam) at the congregational mosque in Bandar Abbas consistently delivered inflammatory sermons against Baha’is. The last such sermon was delivered the day before Rezvani was murdered. Due to the intense pressure that the Baha’i community in Bandar Abbas was facing, Rezvani and several other Baha’is composed a letter to the imam regarding his false accusations about the Baha’is. They also filed a complaint with government officials about the incendiary remarks against the Baha’i community. By taking these steps, the Baha’is were hoping that they could prevent assaults against Baha’is and reconcile with the imam. Apparently, government officials took Rezvani’s actions as an affront and orchestrated his dismissal from his job. From this point on, Rezvani was continuously harassed by government officials and unidentified callers. Baha’is from Bandar Abbas who have recently been arrested say that they were questioned about the activities of Rezvani and their interrogators warned them not to associate with him. Since 2005, more than 60 Baha’is have been physically assaulted or murdered by government officials or plainclothes assailants. Not one of these cases has been prosecuted. If Rezvani’s murder is not investigated, it will only add to the assumption that government officials ordered his murder. His death comes a month after the inauguration of Iran’s new president Hassan Rouhani, who is often described as a moderate. Many hoped that he might change the course of Iran’s atrocious human rights record. However, as media attention focused on the hopeful prospects of a new regime in Iran, Ayatollah Khamenei, the country’s supreme leader, issued a new series of fatwas in which he projected himself as the leader of the entire Shi’a world. In another fatwa Khamenei forbids the publication or public announcement of crimes or corruption related to government officials. In light of Rezvani’s murder, this does not bode well for the Baha’i community in Iran, which may well witness an uptick in violence in the coming months. News media in Iran has been silent on the murder of Rezvani. However, several Persian language outlets outside of Iran, including BBC Persian and Voice of America, have reported the story. Rezvani’s family members have made appeals to the Iranian government to launch a full investigation of the murder. The views expressed in this article do not necessarily represent those of Your Middle East.